Biofeedback is a scientifically accepted method aiming at developing mind-body skills. By providing or "feeding back" the change of biological functions continuously to the client via computer screen or loudspeaker, she or he can learn to control these fuctions deliberately in the course of training. 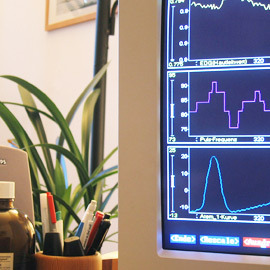 Biofeedback is used to treat a number of psychosomatic and neurological disorders. Patients learn to perceive bodily states and processes more accurately, learn to understand the impact of thoughts, moods and behaviour on the body and learn to improve physiological regulation and homeostasis. This way, a number of disorders can be successfully treated.